The Flying Ducks quilt block is a good tool for a class on using triangles in a different method than the norm. It uses the much underused (at least in my opinion) patch known as the three quarter square triangle. This unit uses three triangles, in two different sizes, to fill a square. The smaller triangles are cut as quarter square triangles and the larger triangle is cut as a half square triangle. These specific cuts are necessary to ensure that the straight of grain of the pieces remains on the outside of the patch. 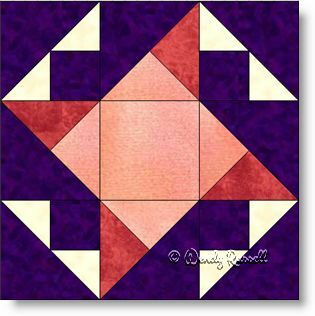 The second use of the half square triangles is to attach the cut pieces separately to the small square, prior to finishing off the patch with a larger half square triangle. This patch can be seen in the corners of the block. The two sample quilts illustrated feature an on point setting with extra blank blocks and a quilt with blocks set side by side and separated by sashing strips. In the end these are two very different looking quilts.